During the course of 2014 and 2015, as part of the Hoxne Heritage Group's programme to commemorate the 100th anniversary of the First World War, the military obituaries of all the men recorded on the Hoxne War Memorial will be posted on the Groups website This will include their connection to Hoxne together with, so far as is possible, a record of their military service. Click on their names on the War Memorial picture above or the list at the bottom of this page. These will be completed in order of date of death, starting with Albert Arthur Copping. Very close to one million soldiers from Britain and her Empire died during the First World War, some 564,000 dying in France or Flanders and 365,000 on the remaining fronts; The Balkans, Gallipolli, The Middle East, Africa and the various seas and oceans that became battlegrounds. The Commonwealth War Graves Commission state that 587,989 men are buried in named graves and a further 526,816 are listed memorials to the missing, these include 187,861 men who were buried but not identified which leaves a staggering number of 338,955 men whose remains were not recovered at all. To the “butchers bill” can be added a further 2,200,000 men who were wounded, 200,000 of whom so severely that they were discharged from the Army or Navy. Another 200,000 subsequently died of the wounds they received whilst serving in the Armed Forces and many of those that appeared to physically recover were so traumatised they could no longer live a normal life. What differentiates the First World War from those that preceded it was that those earlier conflicts were based on the military imperative that armies manoeuvred for position and once they had gained what their commanders perceived to be a significant advantage then the actual combat would be usually swift, although often bloody, but once it was over there followed a period of recuperation. By contrast, the First World War was, certainly by the end of October 1914 and the advent of trench warfare, one of continuous warfare and whilst major offensives always brought a period of intense fighting for the soldier huddled in his trench or dug out, be he British, French or German, the periods of inaction still held the possibility of death or maiming. The manner in which soldiers died on the Western Front varied considerably, many fell together as they attacked enemy positions or as they defended their own. Others died as a result of accident or the sheer randomness of trench warfare, falling to a chance bombardment or snipers bullet. Even if wounded and evacuated to the rear, a soldier would not necessarily survive as the medical facilities available, even at base hospitals, were rudimentary and staff struggled to cope with the sheer number of wounded men being admitted. The First World War was, due to advances in technology, a conflict that brought new methods of killing to the battlefield so apart from casualties caused by rifle fire the medical facilities now had to deal with the wounds from machine guns, flame throwers, heavy artillery and the new horror of poison gas. 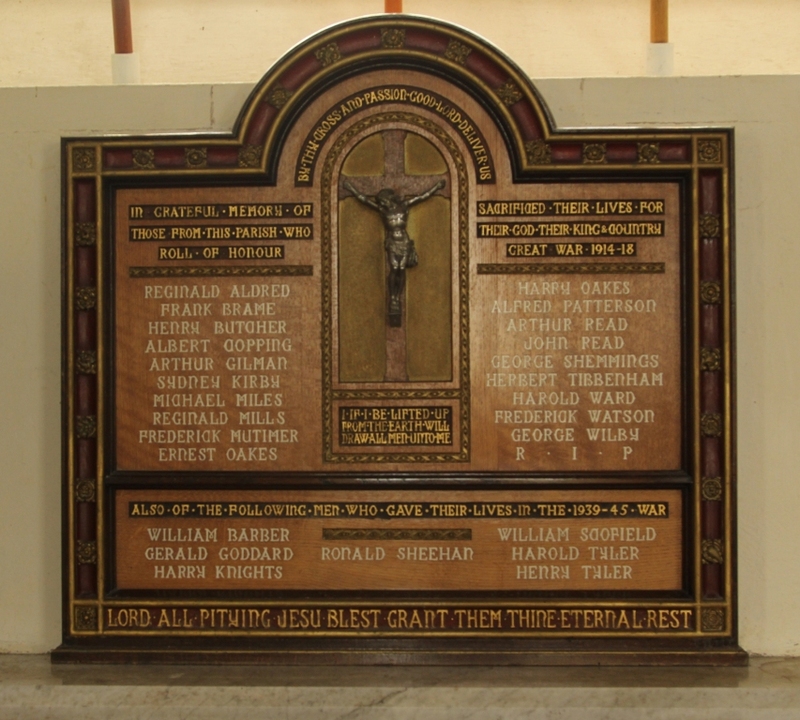 The Hoxne War memorial records the names of nineteen men connected to the village who died during the First World War. They were all “other ranks” and their ages at the time of their deaths varied from Walter Aldred and Reginald Mills who were in their early thirties to seventeen year old Harold Ward. Some were regulars such as Albert Copping who enlisted in the elite Grenadier Guards as a boy soldier in 1907 and served with the 2nd Battalion until his death, during the first Battle of the Aisne, on the 14th September 1914 or Michael Eric Miles who enlisted in 1913 in Alexandra, Princess of Wales Own Yorkshire Regiment (better known from 1922 as the Green Howards) and who died in a Boulogne Base Hospital after being wounded at the First Battle of Ypres. There would be a further two battles of the Aisne and four further battles of Ypres as the war progressed. Others, whether driven by patriotism, a desire for adventure or peer pressure responded to Field Marshal Earl Kitchener's call on the 4th August 1914 for men aged nineteen to thirty to enlist for three years. Two days after this call posters and notices in national and regional newspapers appealed for the “First Hundred Thousand”. Recruiting stations around the country were inundated with volunteers with some 300,000 men enlisting by the end of August and within a year nearly 1,200.000 men had signed short service attestation papers forming what would be known as Kitchener's Army. The period between the August 1914 and July 1915 can clearly be called the year of the Volunteer Army but after that, despite tweaking the upper age limit for enlistment from 38 to 40, the Government perceived that recruitment was beginning to tail off and that, with the casualties suffered in the first year and the ever expanding war fronts, it needed to know what pool of potential recruits existed. In order to ascertain what manpower was available from Britain itself, in July 1915 the National Registration Act was passed in Parliament. This was nothing short of a census of the male population aged between 15 and 65 giving their marital status and occupation. It is very impressive that, in an age lacking computers, only a month elapsed between the date for registration, 15th August, and the publication of the results in mid September. These showed a pool of just over five million men available for military service of whom one and half million were in some form of reserved occupation. No sooner had this review been completed than the newly appointed Director General of Recruitment, Edward Stanley, 17th Earl of Derby, instigated the Group Scheme, more commonly known as the Derby Scheme. Under this plan males between the age of 18 to 40 could enlist or attest with the intention of joining the Armed Forces at a later date, there was an added incentive in that the government indicated that voluntary enlistment would soon end and the last opportunity to attest or enlist under the Derby Scheme would be on the 15th December 1915. The hints that conscription was on its way were fulfilled when the Military Service Act was introduced in January 1916 and came into force on the 2nd March that year. Many of the records held regarding the enlistment of servicemen in the First World War were destroyed when an incendiary bomb destroyed the War Office Record Store in Arnside Street in September 1940, of the 6,500,000 documents held concerning men who served during the First World War two thirds were destroyed. We do not know, with certainty, where or when many of the men on the Hoxne War Memorial enlisted, whether they were part of the year of the Volunteer Army, whether they signed up for the Derby Scheme or were ultimately conscripted under the Military Service Act. As the research continues it is hoped that we may be able to fill in the gaps with hard evidence or accurate deduction. The regiments in which the Hoxne men served were also very varied. Six of the nineteen men served in various battalions of the Suffolk Regiment, two with the Norfolk Regiment. Three served with Yorkshire regiments, all three were living in Yorkshire at the time of their enlistment, Michael Miles was already a regular soldier in 1914 and Henry Butcher and Arthur Gilman enlisted there. Henry in Scarborough and Arthur in York. Arthur was subsequently transferred from the Kings Own Yorkshire Light Infantry and was serving with the Manchester Regiment at the time of his death in March 1918. Two men, Sidney Kirby and Alfred Patterson, served in the Royal Fusiliers (City of London Regiment) which raised a total of 76 Battalions during the First World War. Sidney served in the 24th Battalion, more commonly known as “the sportsman's”, and formed part of the Army's famous “Pals” battalions that suffered heavy losses during the Somme offensive. The remaining men served with a variety of regiments: Reginald Mills, the Queens (Royal West Surreys Regiment), Herbert Tibbenham, Kings Royal Rifle Corps and Ernest Oakes the Cheshires. Only two men served outside the infantry branch of the army, Frederick Mutimer served with the Royal Field Artillery and John Read was a driver with the Australian Field Artilllery. Six of the Hoxne men died during the Somme Offensive, which lasted from 1st July to the 18th November 1916, and although none of the Hoxne soldiers fell on the infamous first day, when the British Army suffered nearly 60,000 casualties including 20,000 fatalities, they were included in the 400,000 men of the British Army who were either killed, wounded or posted as missing by the time the offensive came to a halt. Henry Butcher was taken prisoner in August 1918 but unfortunately died of pneumonia / influenza in a German P.O.W. hospital. Henry Read, serving with the Norfolk Regiment, died in Mesopotamia (now Iraq) and is buried in the Baghdad War Cemetery. The remaining men died in France, Michael Miles in hospital at Boulogne as a result of wounds he received at the first Battle of Ypres. The last casualty was Frederick Watson who was killed on the 29th September 1918 at the Battle of the St Quentin Canal. Two Hoxne families: the Oakes' and Read's each lost two sons during the Great War, Ernest and Harry Oakes, both being killed in July 1916 and John and Arthur Read in October and December 1917 respectively. Few of the Hoxne men have known graves and they join the 500,000 British and Empire servicemen who are commemorated in various Commonwealth War Grave Cemetery's throughout northern France. On the 2nd August 1914 the German Minister in Brussels, Karl-Konrad Von Below Saleske met the Belgian Foreign Minister, Julien Davignon at the Belgian Foreign Ministry and, under the guise of Germany's concern that France was about to violate Belgiums's neutrality, issued the ultimatum that Belgium grant free passage to the German Army through their country or suffer the consequences. The following morning Davignon gave Von Below Saleske a formal note reminding the German government of the guarantees given to protect Belgium's independence and that they would defend their border against any invader be they French or German. On the morning of the 4th August Germany invaded. The guarantees referred to in Belgium's note dated back to the 1839 Treaty of London in which numerous European states, including the King of Prussia, agreed to protect the newly created country of Belgium. As a signatory to the Treaty Britain's Government felt honour bound to protect Belgium's independence, and hence on 4th August, after the German Government failed to respond to the British Government's demand to withdraw from Belgium, war came to Britain. In view of the deteriorating situation in Europe Britain had begun general mobilisation on the 1st August and, for the first time in one hundred years, a British Army was destined to fight on the European continent. Efficient staff work between the French and British military in the years following the Entente Cordiale of 1904 worked out in minute detail all that was required to get the British Expeditionary Force (B.E.F.) to its concentration area around the fortress town of Maubeuge on the Franco/Belgium border some 150 miles north east of Paris. In 1914 the nuts and bolts of mobilisation were the telegraph office, the postal service and the railway timetable. The former two summoned reservists and any regulars on leave back to their regimental depots where the former were issued with new equipment and eased back into military life. The latter then took them to an embarkation port, for the majority this would be Southampton, for the short journey to either Boulogne, Le Havre or Rouen. The advance guard of the B.E.F, mainly those elements dealing with logistical issues, started to arrive in France on the 7th August. The main body of the B.E.F. arrived between the 12th and 17th August and were quickly moved up from the reception camps near the disembarkation ports to Maubeuge so that by the 20th August the concentration of the B.E.F. was complete. Overall command of the B.E.F was given to Sir John French, a senior member of the military establishment whose reputation had been established during the Boer at the turn of the century. The fighting strength of the B.E.F that landed in France in August 1914, some 70,000 men, was made up of I Corps (1st and 2nd Divisions) under Lieutenant-General Sir Douglas Haig, II Corps (3rd and 5th Divisions) under Lieutenant-General Sir James Grierson and the Cavalry Division under Major General Edmund Allenby. Later in the year the B.E.F. would be joined by III Corps (4th and 6th Divisions) and IV Corps ( 7th Division and 3rd Cavalry Division). Whilst Britain was mobilising and the B.E.F. moving its division through the French countryside both Germany and France has instigated their war plans. On Belgium's refusal to accede to the German demand for free passage through their country the Germans launched five armies across their border, their aim, based on elements of the 1905 Schlieffen Plan, was quite simple a wide sweeping flanking movement through Belgium and into northern France that would brush aside resistance take Paris then roll up the French armies and crush them against the remaining German forces holding their positions on the Franco/German frontier. The Germans, running to a strict timetable, were dismissive of the Belgium army and its frontier fortifications and as to the British Army which, by continental standards, was minute the German General staff were equally dismissive though whether the Kaiser Wilhem ever described it as “that contemptible little army” is a moot point. What would surprise the Germans was the speed with which the British took up their positions in France. For the French one of key aspects of their Plan XVII was retaking the provinces of Alsace and Lorraine both of which were lost as a result of Frances defeat in the Franco/Prussian War of 1870-71, this would be achieved by “la offensive a l'outrance” which acted as the default tactic of the French Armies of 1914. In a series of gruelling offensives between 7th and 23th August: the battle of Mulhouse, the invasion of Lorraine, the battles of the Ardenne, Charleroi and Mons the French casualties were horrific the worst day was 22 August when 27,000 French soldiers were killed throwing themselves at entrenched German positions. It is a salutary thought that before the B.E.F. suffered its first casualty on the 21st August 1914, a reconnaissance cyclist called John Parr serving with the Middlesex Regiment, France had lost 260,000 men of whom some 70,000 were killed. Many of the French losses were officers and N.C.O's and these could not be easily replaced at short notice. Plan XVII had been an unmitigated disaster and these little remembered battles of the frontiers were a foretaste of the carnage that was to follow. Two Hoxne men were involved in the opening moves of 1914, neither would survive the year. Albert Arthur Copping would die during the crossing of the Aisne and Michael Miles would die as a result of wounds he received during the first battle of Ypres. Albert was a regular serving with the elite Grenadier Guards part of the 4th (Guards) Brigade 2nd Division I Corps and Michael Miles was serving with Alexandra, Princess of Wales Own Yorkshire regiment, 7th Division IV Corps. The table below lists the soldiers fom Hoxne killed in WW1. Click on their name for full details of each soldier.